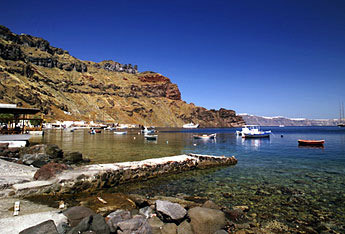 The beaches in the northern part of Santorini are harder to find and and have a distinctive beauty. In the past they were known and frequented only by local residents. 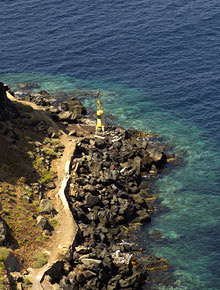 In recent days they have also been discovered by visitors to the island. 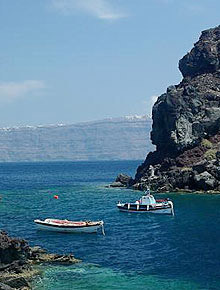 Katharos beach can be found by driving towards Ammoudi Port. It is quiet, with black pebbles & stones. An unusual feature are the two rocks that stand in the middle. It will take you about 3 to 5 minutes to walk to the beach from the parking place. Ammoudi port can be reached by car (you have to circle round the bottom road of Oia village), by walking down the 235 steps, or by catching a ride on the back of a mule. 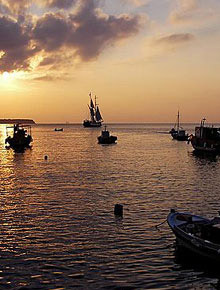 It is possible to swim in the harbour, but the best place is to go is along the path past the taverns on the waterfront, where you will find an excellent place for diving off the rocks. Recommended for strong swimmers. Armeni has a small beach. There are 2 ways to get there. You can either go on foot or by mule and descend 291 steps, or opt for the easier solution which is to get a ride in one of the small boats leaving from Ammoudi port. There is a small tavern for quiet meals. Between Ammoudi and Armeni is 'Armenaki'. Climbing down is hard work. You can swim, but for the moment there are no shops or restaurants.